In a large bowl, combine sugar, flour, baking powder, salt and cinnamon. Whisk to combine. Add diced apricots and white chocolate chips. Whisk to combine making sure that apricots are not clumping together. Add croissant pieces to the flour mix and stir to combine. Hands work well here too. In a separate bowl, combine eggs, vanilla, brandy and orange zest. Whisk well. Add half and half to the egg mixture and whisk again to fully blend. Pour egg mixture over the croissant mix. Pour melted butter into the bowl and get your hands dirty – squeezing and mixing the batter really well. Sometimes your impeccably clean hands are the best tools for getting the job done. Press plastic wrap directly on top of the batter and store in the refrigerator for 4 – 5 hours. Preparing the batter a day ahead is best. Portion the batter into soufflé cups that have been sprayed with non-stick baking spray. I used an 8 ounce soufflé cup. Place soufflé cups on a cookie sheet and place into a 350 degree preheated oven. Bake for 20 minutes, rotate and bake for an additional 20 -25 minutes more. The tops should be golden brown in color. Remove from oven and place on a cooling rack. Allow bread pudding to fully cool before removing from the cups. For serving, rewarm in a 250 degree oven for 15 minutes. Spoon warm bourbon sauce over bread pudding and top with whipped cream and a sprinkle of cinnamon. For many customers, this is their favorite bread pudding of all! This recipe can be cut in half. I want to make this in a large cassorole dish for Christmas. Any ideas on how long to bake it in the oven ? Same temperature? Yes, same temperature and a 13″ X 9″ casserole dish should hold the batter. You will probably need to bake for one hour. Keep an eye for that golden brown top. Make sure to prepare the batter the day before you bake. Good luck…you will be showered with appreciation from your family and guests!!! Omg! This is the best bread pudding I have EVER tasted!!!! I have had it 4 times this week and 5 lbs later…worth every one of them! Thank you. A customer fav, for sure. Just another walk around the block! So glad we had the bread pudding when we were in the restaurant last month on vacation. It was incredible! I have some batter resting in the fridge right now. Question…….Do the leftovers after baking freeze well? Looks like the recipe makes quite a few. Yes, the bread pudding is a customer favorite. Hope it turned out well. I have never frozen the baked product. It seems like it would do well. If you try, let me know how it works. Thank you for your patronage. My man and I are bread pudding fanatics, and your White Chocolate Apricot Bread Pudding has definitely set the standard by which all other bread puddings we try will be judged. We LOVE it…There is no doubt this is THE best EVER!!! 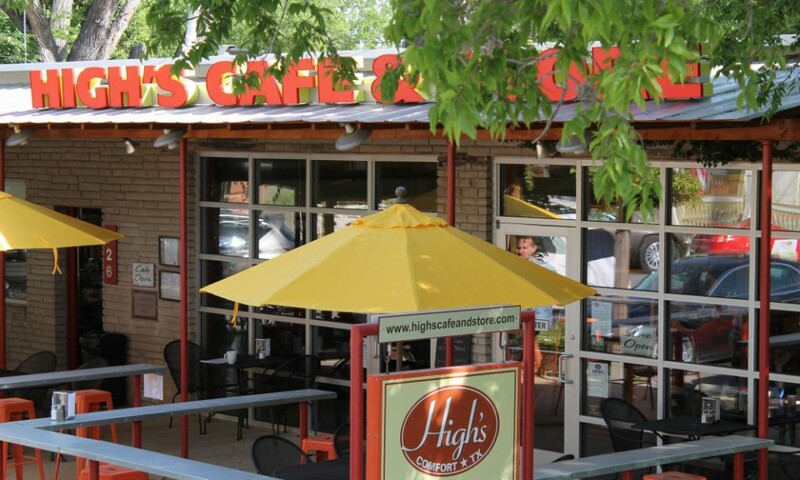 First time we had it at High’s was July 16th, and went back on September 24th solely for the bread pudding. Thank you! Thank you for the comment. This is a definite favorite here and we have converted many “non-bread pudding folks” into FANS. I hope you’ll try the recipe at home. Great holiday dish and it can be baked off in a 9″ X 13″ baking dish. I love to hear this. Glad you are trying these recipes out. Happy Turkey to you and yours. Try the Pumpkin Cheesecake. Are the Apricots dried or caned? Dried. You’re welcome. Always a pleasure to cook for an appreciative audience. I ate this luxurious dessert with the bourbon sauce last week at the High and thought I had reached the pearly gates! Absolutely the best thing I’ve ever eaten! It was the highlight of my week in Texas! WOW! Thank you for the divine words of praise!!!! I hope you’ll share with friends back home. Yes! I’ve been waiting for this one.